The Arrowfield Estate has been sited at Jerry's Plains since 1824 – once the largest vineyard in Australia, the vineyard and winery now produce premium grapes and wine for both national sales and export markets such as the UK & Japan. Our company is keen to introduce an innovative and exciting event for a good cause – to this end, we plan to run a full day event at the winery supporting the Leukaemia Foundation. Whilst raising the profile of the region, promotional material will market the day as a fundraiser for the Foundation and a great day out for everyone. 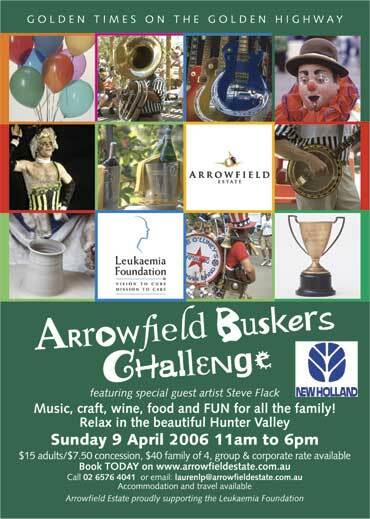 The inaugural Arrowfield Buskers Challenge is the event! I saw the Darby Street Parade advertised and hoped you may be able to help me with contacting street performers, musicians etc. Alongside the buskers’ competition, there will be non-stop entertainment with a wide variety of food and craft stalls, wine tasting and a range of events for the family to enjoy. This year's Challenge will be taking place on Sunday 9th April 2006. As you can see, we plan to have 5 categories – There will be a number of prizes – 1 for each category and a grand busking prize for an overall winner. I am writing to you today for a number of reasons – I hope that you are interested in attending as one of our craft stalls – as it stands at the moment, there will be a nominal charge to attend, but you will have the opportunity to display and sell your work. It’s a great opportunity for locals to get to know how you are and what you do! I thought that you may also be able to help in terms of other contacts for the actual competition – musicians or street performers.